Home » HALLOWEEN DECORATIONS » 15 One-of-a-Kind Halloween Backyard Decorations Out Straight From the Pages of a Book! The availability of a large area for a great festive decoration makes backyard decor the most vivid and elaborate something for Halloween. Upcycling old stuff into pretty pieces, and subjecting autumn elements to a dash of spooky creativity is all it takes to work up these Halloween backyard decorations that look straight out from the pages of a book. No one would imagine that a regular yard can turn into a super scary graveyard when it comes to dressing up for Halloween. But this idea gets that done, that too without making things look over the top, having faux gravestones grab random spots in the most realistic fashions. The tombstones here are all about upcycling some wood as it’s actually leftover boards and some paint that goes into the making of the structures. Although, the project calls for some woodworking, it also lets you take some assistance from the kiddos, thereby involving them in some festive action. Right from cutting the pallet wood boards into basic rectangular shapes to turning them into faux tombstones, adding appropriate supports to the structures, and adding the paint job and the epitaphs, this one’s a detailed step-by-step tutorial guiding you through the whole process. 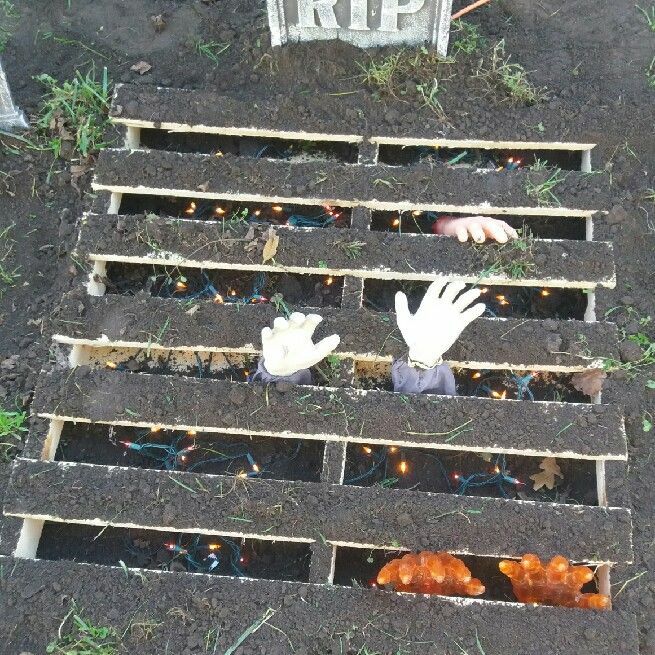 We bet your house having a DIY faux cemetery in the yard is going to send some chills down the spines of everyone who gets a glimpse of the same. Of course, make sure you take the decor off the next day! If totally freaking everyone out with your yard is what you are aiming this Halloween, then you won’t come across an idea any better than this spookylicious Pin. This one’s got some scary zombie or ghost hands oozing out from faux graves that have also got a tombstone as their accompaniment. The thing that makes the scene stand out is that the graves seem to glow from the insides – brought by the work of some string lights going underneath. Whipping up the project is surprisingly budget-friendly as wooden pallets form the building blocks for the same. The idea is to dig a square pit in the yard, further covering it with a large wooden pallet to create an open grave kinda appeal. Next, you decorate the bottom of the pallet with some red lights, advancing towards adding the ghost hands. Place the hands in a strategic manner that creates an illusion of them emerging out of the grave. Prefer going for a weathered texture and a chippy paint job to the pallet board to make sure it looks old and roughened up, adding to the vibe of the assembly. Looking out to create a dramatic scene with the Halloween decor in your backyard? Ditch small decorative items and go for this creepy Halloween coffin made from old pallets instead, preferably, some faded weathered ones. The other supplies you are going to need to start the construction is some nails, a circular saw, and a crow bar. The pallets are harvested to get loads of individual slats that are further assembled to form the coffin. The construction begins with building the front and back panels, further adding the side panels and the beams to secure the inside corners of the joints of the panels. A few hinges secure the lid, while a few final touches add glory to the structure – you’ve got a chain and lock that binds the coffin, while a skeleton hand pops out from one side of the lid. Even in the dark, this amazing spookiness is going make it mark, all it takes is some bright green neon lights installed inside the coffin, making their way through the gap in the lid. Learn the step by step process to forge the idea as showcased in the below Instructable. Apart from a cool decor and assembly of items that celebrate Halloween in your garden just right, it’s super significant to have a clever yet spooky lighting that not only goes with the spirit of the occasion but also brings out the most of the decor that you have done. This guide by From House to Home takes you through choosing the right colors of Halloween lights for different settings and purposes. Blue and green work as the perfect spot lights to make the whole atmosphere a bit scary, whereas orange and red lights can bring out the perfect contrast to blue and green at the same time being bright enough to help people walk around the yard. Apart from explaining the effect of these hues, the guide also tells what color not to go for if you want to make sure everything pops out with perfection. How you can use natural branches and trees to hang the string lights, or go for floor lanterns to light up the path are just amazing! Not on this list alone, but these DIY concrete smiling stones are perhaps, the most out-of-the-box and never seen before Halloween backyard decor ideas you will find on the internet. After all, how many of us have seen yard stones flaunt such happy smiles with thise bright white teeth, that too with such surprising realism? Giggles and screams join hands in hands with the totally do-it-yourself idea here, calling for these concrete stones that can be put together for pennies. Even if you are new to concrete craft, this step by step tutorial shared on Instructables is going to make everything a literal piece of cake for you. All you need is a denture shape silicone ice mold, a quick setting concrete mix, mixing tools, vessel, a pair of gloves, a dust mask, a tin foil, a hot glue gun and glue sticks, some duct tape, clear acrylic gloss medium, some acrylic pearlizing medium, a few brushes, water, some metal zippers, a pair of scissors, a palette knife, and some acrylic paints in white, black, blue and red – wherein everything is readily available in just about any craft store. Looking at this cage hanging in the garden, one can never figure out that it was actually a super budget-friendly plastic basket that has been subjected to some dose of creativity! Coming together for a deal of 5 dollars each, these hanging cages call for a trip to the Dollar Store and a handful of supplies. Once you gather 2 laundry baskets for each cage, some plastic chains, some zip ties, black spray paint, and a pair of scissors, you are all set to advance towards the construction of this personalized beauty! The basic structure of the cage is built by joining two plastic baskets together with their rims cut down, and tying them together with lots of zip ties. Every 6 spokes of the baskets have got a chain rung attached to them, wherein different lengths of chains are attached to the top of each cage to allow for hanging. Remember to paint your baskets with black or any spooky hue of your choice, throwing in a faux skeleton inside to take the levels of eeriness to new heights with the finished piece. The author calls this one to be a surprisingly simple project, and taking a thorough look at the steps of construction, we totally agree with her. However, the kind of end results the idea flaunts, having a group of ghosts joining hands together to form a circle around some fire in the yard is simply out of the world. Speaking of the supplies required, you are going to need some cheap plastic drop cloths, some white paper or even leaves to stuff the heads, some lengths of rebar, lots of clear packing tape, a bunch of older outdoor white, and some Christmas Lights with a long extension cord. You begin with hammering your rebar into the ground in a circle, and cutting lengths of drop cloth double the height of the ghosts. The heads are formed by balling up paper and placing it in the center of stretched out drop cloth and covering it with the same. The head is placed on the rebar and packing tape is wrapped around plastic to form the neck, cutting up from the bottom of the plastic to form ribbons. More tape is added to form the waist area, cutting long strips of drop cloth for the arms, crisscrossing and tying the strips around the chest. The ghost hands are knotted to the next one, finally placing a heap of lights in the center. Serving up two functions at the same time, these ghost leaf bags not only add much more organization to your yard by storing all the fallen oven autumn foliage inside, but also supporting those faux tombstones that you have worked up for an outdoor Halloween decor. And you wouldn’t believe it’s nothing but some kitchen garbage bags that go into the making of these tiny wonders of spookiness. To make these ghost leaf bags, the author filled some 13-gallon white garbage bags with leaves, further tying them shut and plopping them on the ground while making sure that the opening-side stays down. Those cute ghost faces are drawn on the filled bags using a black permanent marker, and voila! The bags are ready to grab some random spots in your yard! The part where you work up the ghost face features also lets the kids join the craft, making everything so much more fun. To learn more about the ghost leaf bags, head to the tutorial by Our Everyday Art. Now this is how you creep the guests out with kid-sized ghost displays standing in the backyard! If you have got little kids, then you must be having a bundle of their old dolls lying in a toy storage that they don’t play with anymore. 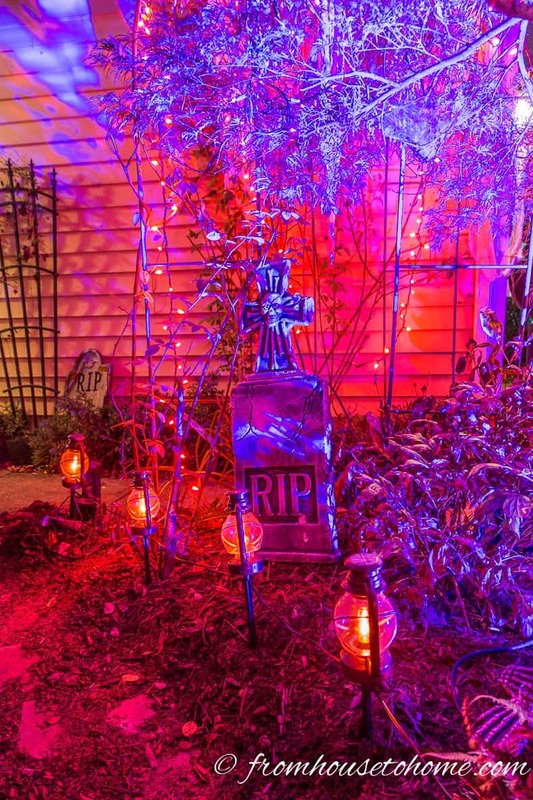 It’s time to give them a makeover for Halloween and pull off a one-of-a-kind backyard decor with the same, turning them all bloody, dead and ghostly. Just grab as many dolls as you have got and get some paint job going – simply take some red paint and make random blood marks on the faces, hands and legs of the dolls, while their hair seem to be all messy and falling all over the place. Darkening up the eyes with some black paint and drawing faux stitch marks at certain spots would make them look oh so eerie. If it’s about going a little gory, then you just can’t go wrong with these super creepy dolls – what if they start walking and all of them together head towards the front door of the party hall? Jack in the box is perhaps, one of the most classic ideas in the world of horrifying Halloween decorations. That joker face that seems to spread terror around instead of making everyone laugh is no less than a nightmare when it pops out of a box that should otherwise be holding some playstuff for the kiddos. So, working up a scary jack in the box in the backyard is going to be an amazing something. The devilish jack this time resides in a wooden box that sports embossed alphabets on each of its side, but with a twist – it has got blood splatters all around, further taking things up a notch with a weathered texture. The lemon green spring makes things functional here, while the jack himself has got blood coated teeth, spooky red messy hair and eyes that could kill. Oh yes, he has got a stitch scar on the forehead and a bright red popping nose. Not only the for the kids, but jack in the box is a sureshot fear generator among the adults too, taking them to their childhood days when the scary joker was a matter of bad dreams! Although, this one is a limited Etsy marvel shared by Craftymofos, you can always get some inspiration from this stunningly carved pumpkin that replaces the traditional idea of a scarecrow and assemble one of your very own that stands tall in your garden and serves the purpose of scaring not only the crows, but everyone who passes by the space. The material that goes into the making of this nightmare before Christmas inspired pumpkin king scarecrow includes some burlap, some PVC, hard foam, cotton, some paint, wood, and Corduroy. Make sure you build the whole structure in individual pieces so that it can be disassembled and stored once the Halloween season passes. You will need to buy some rebar or some other strong stick like bar to drive the scarecrow into the ground. To make it glow even in the dark, install a simple battery-operated tealight inside the pumpkin king and it would rock the evenings without a fail. The red shirt and the Halloween town signboard right behind the pumpkin face are the highlights of the whole assembly. Why go for just a few pumpkins to charm up Halloween when you can work up a whole union of such cuties. The pumpkin patch singing pumpkins seem to have gathered right in your backyard to spend a memorable evening together, having one of them stand tall in the middle on a raised platform, also creating a scarecrow like vibe. Many bunches of husk stand around the king pumpkin and everyone gathers inside a wooden fence that comes with a rustic feel of its own. You can get as vivid with the expressions of the pumpkins, while also adding variety in terms of their sizes. Of course, carving plays a major part in working up the project, but the fact that each of them comes with a different face also makes sure that you don’t have to strive for perfection with each of the gourds. Loads of leaves, grass, old wooden tires and torn burlap cloth help to add finishing touches to the decor, throwing old worn out drapery over the scarecrow pumpkin. Adding a faux bird over one of his arms works wonders for the overall scene here. Along from wicked witches that seem to be engaged in supervising whatever they are brewing in their large cauldron, this Halloween scene has got everything that’s needed to create some evil spells! Three large wooden branches are attached together to form a pyramid-like structure which further hangs a large black cauldron to itself with the help of thick chains. Smaller branches cleverly attached to the structure serve the purpose of hanging lanterns that you can craft using mason jars or traditional vintage ones. More branches go underneath the cauldron that seems to throw bright neon green glow or smoke above, creating an impression of some magical potion brewing inside. Three huge jack-o-lanterns are placed at the bottom of the whole structure, having screaming expressions carved out with true finesse and bright golden glow oozing out from the eyes and the mouth. Two witches stand on both sides of the cauldron, having different sizes of tree branches, two wicked witch caps, worn out drapes and a few other supplies as the chief construction elements. You’ll love those bright green faces of the witches, bringing in so much more life to the decor. What if a witch landed on your yard this Halloween and turns that outdoor fire pit into a one-of-a-kind cauldron where she could whip up her magic! To setup the scene, grab some super huge candlesticks and paint them black, followed by placing them along the edge of the firepit, and placing large white candles on each of them. The firepit has got a metal bucket that holds loads of coal and oozes out grey smoke, thereby enhancing the spooky essence of the setting. Of course, the witch will need some dark magic books to help her work up her spells – so grab a few vintage-looking books and give them a magic-perfect makeover, placing them on the edge as well. A store-bought witch mask will let you build a wicked witch figure, coupling up the mask with torn drapes, a pointy hat, some thin branches or even some paint. When it comes to the embellishments that add the finishing touches to the scene, you can always go for faux tombstones, lanterns, candelabras and more! Of course, a little dramatic – but going for some drama seems to be a worthwhile thing for the 31st of October. Huge skeletons or wicked witches, bunches and bunches of carved pumpkins or beautiful hues of foliage, it’s not an oversaying that these Halloween backyard decorations are no less than an excerpt of a fairytale.